What do you guys do for pedal modifications to heel toe in a FB? I feel as though I should upgrade to clown shoes to reach both pedals. Pics help on DIY solutions. Bend the gas pedal over so it is closer to the brake pedal. Just grab it and pull it sideways until it is closer. You can also put a gas pedal extender on it to make it longer so it falls where your heel would be. On my FB bending was enough. The attached picture shows what I have done on my ITA RX7. I bolted a flat plate to the accelerator to span most of the gap between the brake and accelerator. 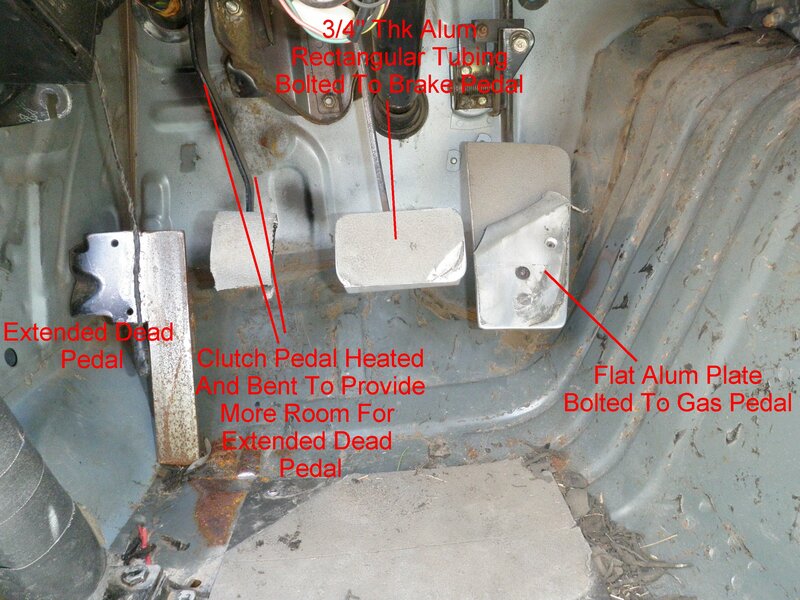 A 3/4" thick piece of rectangular tubing was bolted to the brake pedal to span the rest of the gap and to bring the top face of the brake pedal even with the top of the accelerator. Makes heel and toe much easier. I have been using this setup for 15 years and really like it. Hate getting into a racing RX7 without it. I recently expanded the dead pedal to make it easier to keep myself braced. To make room for using the dead pedal I heated (w/ Oxy-Acet torch) the clutch pedal lever and moved the pedal over 1-1/2 to 2 ". Also welded half of a 2" dia (I think) exhaust pipe to the face of the clutch pedal to make it easier for co-drivers to reach the pedal. The rounded surface is really comfortable to push against. I'm happy with the whole set up. YMMV though. Of course, I forgot the picture. Here it is. Excellent, thank you both. I think i will try to bend the gas pedal over closer to the brake and see how that feels, if it feels funny then it looks like bolting a plate over the top of it would work very well. The dead pedal mod is very slick- I think i'll try this. Do you find it easy and natural to move your foot from the dead pedal then onto the clutch and to the floor quickly without hitting the brake or dead pedal, or is it positioned a bit deeper so you can just slide off and onto the clutch? Thank's again for sharing, this is a huge help. One thought: bolting a plate to the gas pedal is *much* easier than bending the pedal arm and has the advantage that it's easier to adjust the spacing by trimming the plate. That dead pedal extension isn't for everybody - I have large feet (size 14 - clown shoes indeed) and even with narrow driving shoes on I would be very worried about accidentally catching the brake pedal with my left foot during a gear change. Last edited by wrankin; 08-04-15 at 09:47 PM. The dead pedal extension was to get around the roll cage tube that is bolted to the floor. If it were not in the way, I would not really need the extension. That is also largely why I bent the clutch pedal over. Having said that, the I really like having the clutch pedal closer to the brake. I have not had any problems catching my left foot under the clutch pedal. When I did the dead pedal extension, I did extend it to the floor, so that my left foot could not slide over and get stuck between the dead pedal and clutch (holding the clutch down). I was originally thinking of putting the top surface of the dead pedal even with the clutch. Doing that though resulted in kind of an awkward position for my left leg. So I raised it a little from stock (in the slots rather than the holes) so that my leg was a little more extended.